Moldex Flip to Listen Dual Mode ear plugs allow you to easily switch between protection from loud noise, and the ability to hear clearly -- without the need to remove your ear plugs. This is not only convenient for a wide variety of uses, but it also helps ensure compliance in the workplace. When you need to protect your hearing, but you also need to be able to clearly communicate with those around you, Moldex Flip is an ideal solution. Flip works by providing two different modes of hearing protection. The key is a flip-to-open cap on each ear plug. At the base of each Flip earplug's stem, there is an cap that can easily be switched from closed (NRR 24) to open (NRR 4) or vice versa. The result is that you don't need to remove Flip ear plugs in order to have a conversation or listen to safe sounds around you. Here's an example of why Flip to Listen is so handy: imagine you are working in your home garage wood shop. You want to listen to music while you work, but you also know you need to protect your hearing when you're using your power tools. So you just flip the caps on your ear plugs closed before you start up your table saw, and then you can flip the caps open again when you're finished sawing to enjoy the music playing on your nearby stereo. Flip works just as well at home as it does at the factory, construction site, or other noisy venues. The cap stays attached to the ear plugs, and an (included) optional cloth cord ensures the ear plugs stay attached to your person, making these earplugs perfect for workplace use and wear on the go. These reusable ear plugs feature a 100% PVC-free triple-flange design, with a stiff central stem for quick push-in insertion, and three super-soft, flexible flanges to seal against your ear canal. This "acoustic seal" helps you get the great fit that is so essential in keeping hazardous noise out of your ears. Since Flip is comfortable enough for all-day wear, the ability to switch between NRR 24 hearing protection and clear listening means you don't ever have to refit the ear plugs as you go about your day. Moldex knows you have better things to worry about than taking your ear plugs out and putting them back in correctly every time you want to talk. Moldex Flip to Listen is reusable, and these ear plugs can be washed in a little warm, soapy water to keep them clean and hygienic, as well as ensuring the flexible flanges stay soft and continue to provide an effective seal against noise. The same pair of Flip plugs can be used for weeks or even months with proper cleaning and care. The included FREE Pocket-Pak® carry case lets you keep your Flip ear plugs safe and clean in between uses, and fits easily in a pocket or purse. The included optional cloth cord can help you keep track of these ear plugs when you do need to remove your hearing protection. Includes one pair of ear plugs with case and cloth cord. 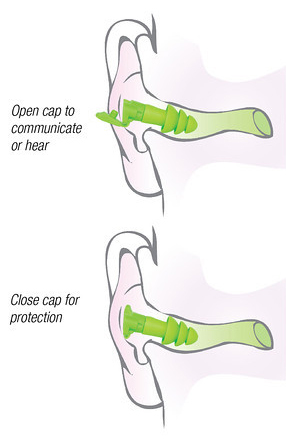 (NRR 24/4) At the base of each Flip earplug's stem, there is an cap that can easily be switched from closed (NRR 24) to open (NRR 4). You don't need to remove Flip ear plugs in order to have a conversation or listen to safe sounds around you. Case of 200 Pairs - Best Value! Moldex Flip to Listen Dual Mode Ear Plug (NRR 24/4) (1 Pair)2RonJune 3, 2015Not nearly as comfortable as standard Moldex plug. Door works but background noise is amplified when door is open. i.e. while trying to carry on a conversation in a restaurant.